Southpaw struggles. It has the weight of one of Jake Gyllenhaal’s best performances, but a pedigree that wastes it under a sea of cinematic melodrama. A drinking game could be invented where imbibers are asked to “spot the boxing cliché” and down a drink, though that would require an FDA warning label — “Beware of Alcohol Poisoning” — as the credits roll. Touching on every other boxing movie ever made (even Raging Bull, though indirectly), Antoine Fuqua tries to make the most of Kurt Sutter’s script. Unfortunately, only Gyllenhaal’s lead character comes across with any authenticity or realism. Even then, this boxer is stuck with the unfortunate name of Billy “The Great” Hope. When we meet him, he’s just won an important title bout. His wife (Rachel McAdams) loves him and his daughter (Oona Laurence) adores him. They want him out of the game. He starts thinking about retiring. Everything seems great in Billy’s life until an incident at an awards show that leads to unholy familial tragedy. After his manager (Curtis “50 Cent” Jackson) abandons him for his competition, Billy enters a downward spiral of self-destructive behavior. He loses everything — including his child to the State. 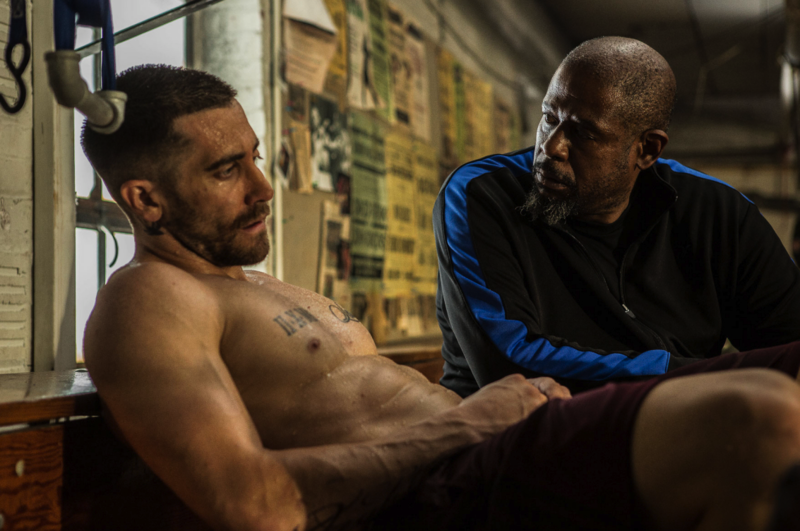 Desperate to get her back, he takes a job as a janitor at a gym run by Titus “Tick” Wills (Forest Whitaker), who eventually agrees to train Billy for a big comeback. If that doesn’t strike you as generic and banal, then you haven’t seen enough boxing films. Southpaw would have been perfectly suited for Wallace Beery, Jack Palance, or even Mickey Rourke, all of whom spent time in the square circle. You keep waiting for the moment when the weepy child begs the champ not to fight anymore, and you anticipate the heartfelt tear-jerking that follows. This is a movie made out of previously discarded scraps, the remnants sewn back together as best as Fuqua can. Along with Gyllenhaal’s electrifying central turn, he’s the only reason to tolerate this mess. He can still find the thrills in the expected, the darkness in the otherwise bright bullspit of the screenplay. This is one of those cases where your love of an actor and his work will guide your overall appreciation. If you think Gyllenhaal was robbed when it came to his portrayal of a psycho video news “journalist” in Nightcrawler, if you’ve watched his other work and wondered why he doesn’t own a dozen Oscars, then you’ll enjoy almost everything Southpaw has to offer. The actor does a buffed up transformation, turning his otherwise ordinary leading man look into a cage animal of aggression. There are times we you can’t believe this is the same guy who starred in Donnie Darko. He’s even more impressive as an action lead than in his attempted summer tentpole, Prince of Persia. Sadly, no one else is his match. That’s because no one else is given something solid to work with. McAdams disappears early on, 50 Cent has a hard time locating a genuine note, little Miss Laurence is the miniature damsel in distress, and Whitaker is Burgess Meredith’s Mickey from Rocky transported ahead in time a few years. They’re the stalwarts of this kind of story, the elements that are supposed to gel to give the lead the extra lift he needs. Instead, it’s the other way around, Gyllenhaal practically drowning to support the ancillary figures. Even the fight scenes feel rote, especially after watching what Scorsese did to re-imagine the sweet science. Audiences won’t mind, probably. They haven’t seen pulp like this in many a decade. Still, for those who like their sports movies manly and chiseled out of machismo, Southpaw will push your testosterone tolerances. It doesn’t want to deliver so much as make you meet it halfway, throwing out obvious plot points for you to pick up and carry. With a weaker central performance, the movie would be an even bigger mess. As it is, Gyllenhaal’s work deserves respect and attention. Sadly, it’s surrounded by stuff that doesn’t.